Gregory Poole has an unmatched ability to provide machining and boring services for clients in the government and defense industries. We know your equipment must deliver tight tolerances, and you need to keep downtime to a minimum when on contract. Partner with Gregory Poole for services that keep you and your critical assets working their best — everything from preventative maintenance to emergency repairs. Field service from our fleet of mobile machine shops. Our trucks have tools such as oxygen/acetylene torches, air compressors, an 8,000-pound crane, and sophisticated diagnostic and measuring systems. We can quickly respond — typically within 24 hours or less — to any concern at a job site in eastern North Carolina. In-house welding and line boring. 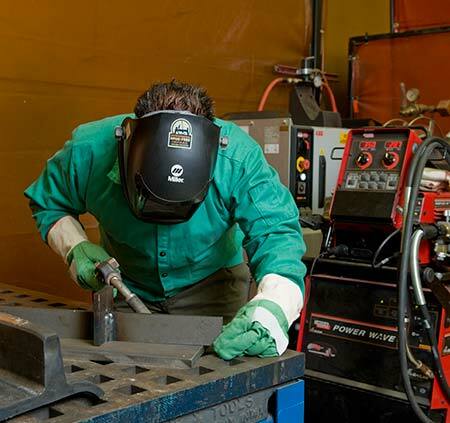 We offer complete fabrication services using stick, MIG and TIG welders. Our team members are adept at everything from machine repair and rebuilding to new part fabrication. We can also provide line boring to restore worn-out components by re-boring holes anywhere between 1½” and 14″. Transmission and engine rebuilds, dyno testing, undercarriage track repairs and more. For non-emergency service needs, contact our machine shop and tell us more about your project. You’ll learn how our machining expertise can help you get the job done right. Need on-site service at your location, fast? Call our office directly to request immediate assistance from a team member in your area. Since 1951, Gregory Poole has been providing a wide range of support services for clients in multiple industries. As our business has grown, our service department has grown with it. Over the years, we’ve expanded our machining and fabrication capabilities to include on-site and field boring, as well as other machine services. For government contractors, this means we can respond faster to any issues with your fleet of heavy equipment, helping you get back up and running quickly. With Gregory Poole working for you, you can meet your deadlines and grow your business.